Why the heck is there a tank ?!? The HF Filter part of your card is either badly designed or of minor quality. Go to Porotuner's site for a guide on how to modify your card. Basically, it involves shorting a few (max. 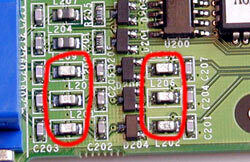 6) Inductors and, optionally, removing a few (max. 9) capacitors. It did not help completely (but perhaps that's only because of my quite old monitor), but now the images I get are visiby sharper ! This will void your warranty and most probably also the FCC license. So, nothing to worry about ;-) Let's go ! I just got e-mail from this guy telling that removing the capacitors is the most effective thing, the inductors are not that important. Hmmm ... my picture is not really sharp now ... improved, but not SHARP. Well, I fired up my soldering irons and kicked those capacitors. Guess what ? Crystal clear images now. Not fuzzy any more. If you have a GeForce 2 or MX, I heartily recommend reading this page mentioned at top. When I first read it I thought it was a Hoax, but after thinking a while (about what removing and shorting these things means in electrical terms) and reading postings on Usenet, I decited to give it a try. So ... this is NO HOAX! Remember : No Risk - No Fun ... No Brain - No Pain. That's quite a delicate work! Do this only if you're a pro - or know someone who can do it for you !